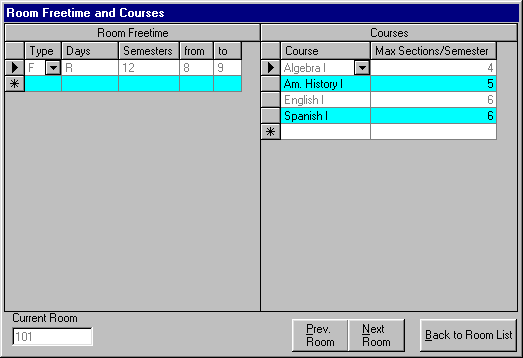 This is the Rooms free time & courses window of Solstar 2001. For a description of the buttons please scroll down. This is the search window for rooms in Solstar 2001. Click on "Back to Room List" to close it. : This column can contain either "F" or "S". "F" stands for "fixed", which means that under any circumstances this period has to remain free. "S": stands for "selectable", which means, that Solstar 2001 will try to kepp this period free, but if it is required, Solstar 2001 can use this period for scheduling. : This column contains the day(s) you want to keep the room for the following period(s) free. : This column contains the semester(s) for which this condition is valid. : These columns contain the periods you want to keep the desired room free. : Here you can select the desired course to be taught in that room. : Here you can enter the number of sections per semester.